Agate is excellent for balancing emotional, physical and intellectual energy, and in harmonizing Yin and Yang, the positive and negative forces of the universe. 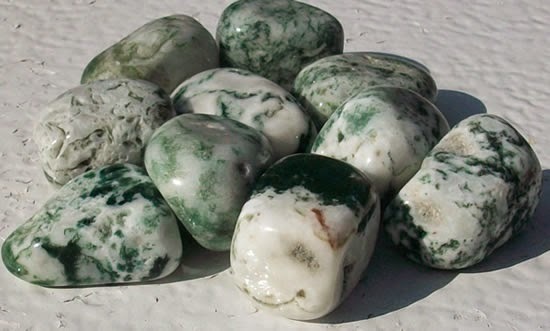 Moss Agate is extremely beneficial as a body strengthened in times of stress. Its steady energies aid those who feel unstable or ungrounded. It is an excellent stone for convalescing after illness, or in recovery from addictions. It enhances mental concentration, persistence and endurance, making it useful as an aid in physical exercise programs, therapies, or body building. Moss Agate is a cleansing crystal, useful for clearing personal energy systems as well as environmental. It is helpful in reducing sensitivity to weather. It brings new friendships, and worn as jewelry or placed over the heart at night, will attract new love or the re-growth of former love. 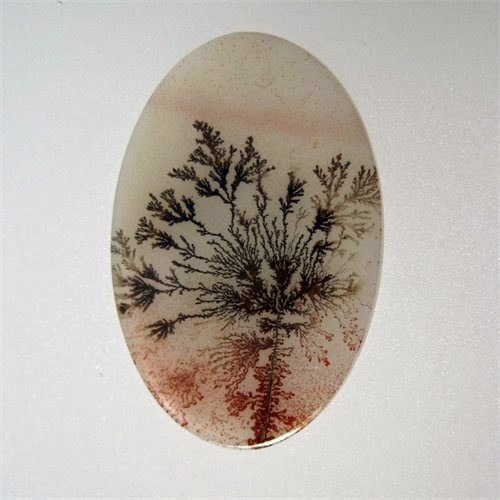 Moss Agate enhances the acuity of the senses and neuronal activity. It helps eliminate depression caused by left-right brain imbalance, and stimulates mental function by improving concentration, perception, and analytical abilities. Moss Agate is anti-inflammatory and helps treat infections and swelling, colds and flu, and lowers fever. It is useful for long-term illness and recovery, boosting the immune system, and is thought to prevent hypoglycaemia and dehydration. As an elixir applied to the skin, Moss Agate treats fungal and skin infections and irritations. Moss Agate is helpful to the circulatory system, regulating pulse and other heartbeat irregularities. It cures buzzing in the ears. Wearing an Agate in the middle of the chest strengthens the cardiac muscle, and heals emotional disharmony. Moss Agate stimulates the digestive system, relieves gastritis, and aids in the elimination of toxins from the body. Agate may also reduce the symptoms of epilepsy, and for some people guards against sleepwalking. Moss Agate releases deep-seated fear and stresses, expanding one's personal space and growth. It stimulates a good self-image and strengthens positive personality traits, including the ability to get along with others. An optimistic stone, Moss Agate is helpful for those suffering from difficult life circumstances, depression or brain imbalances to find hope and trust, and to keep trying. Moss Agate is associated with the Heart Chakra, located near the center of the breastbone. It regulates our interaction with the external world and controls what we embrace and what we resist. It gives us the balancing ability to be ourselves within the environment. When the heart chakra is out of balance you may feel either controlling or controlled in a relationship, and become critical of the little foibles of others. You may well find yourself having inappropriately strong emotional responses to everyday external stimuli. Green crystal energy is used to resolve blockages and to re-balance the heart chakra, helping us understand our own needs and emotions clearly. We can deal with the ebbs and flows of emotional relationships, understand their cyclic nature, and accept the changes. Moss Agate encourages the spiritualization of one's life in all aspects, helping to overcome negative behaviours which may be karmic attachments from past lives, and to find the will to replace these patterns with the Divine blueprint of one's Higher Self. Its steadfast energy holds these aspirations into view until manifestation can take place. 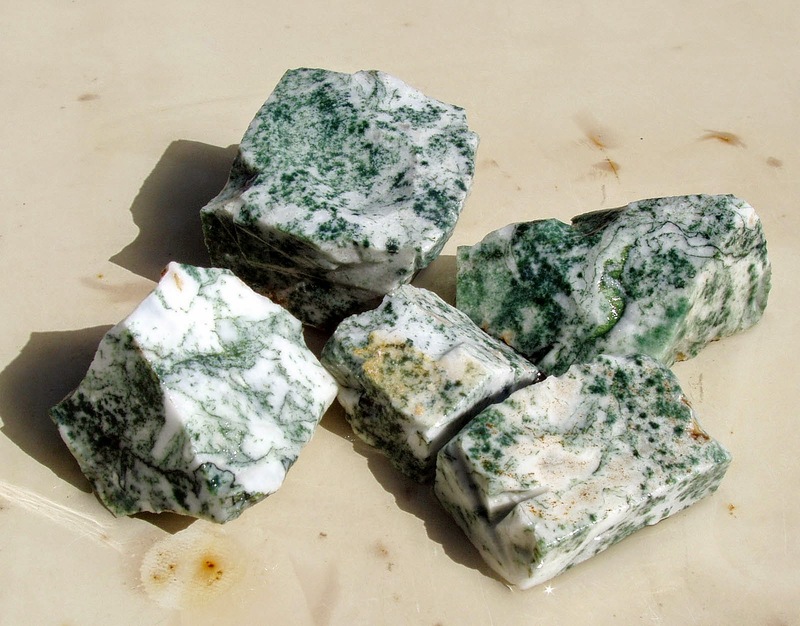 Moss Agate utilizes the energy of green. It is a "growth crystal" - a powerful conduit of the earth's Life Force of birth, development, and creation, and of the power of nature's constant renewal. It is a potent aid in nurturing, whether of fledgling family relationships or a new business venture. Green crystals are perfect for keeping a venture on course, a project on schedule, and life on track. 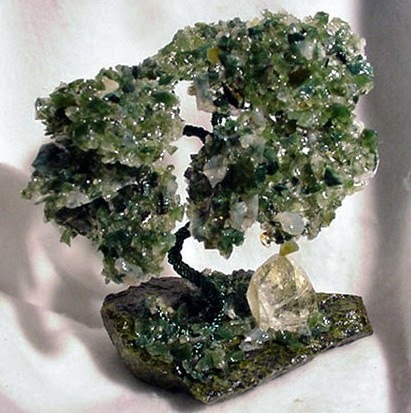 Lighter Green crystals promote spiritual growth and renewed commitment to a higher purpose. Those of a darker hue are talismans of physical growth and strength, and safety in travel. Moss Agate provides a wide variety of crystal formations conducive for meditative focus. The intricate movements within the crystal encourage a calm, relaxing state and open the mind to higher thought and inner truths. Project your goal or the image of a completed project into a Moss Agate, and it will magnify the intentioned energy and assist in achieving the goal.